Cancer-killing "sticky balls" can destroy tumour cells in the blood and may prevent cancers spreading, early research suggests. The most dangerous and deadly stage of a tumour is when it spreads around the body. Scientists at Cornell University, in the US, have designed nanoparticles that stay in the bloodstream and kill migrating cancer cells on contact. They said the impact was "dramatic" but there was "a lot more work to be done". One of the biggest factors in life expectancy after being diagnosed with cancer is whether the tumour has spread to become a metastatic cancer. 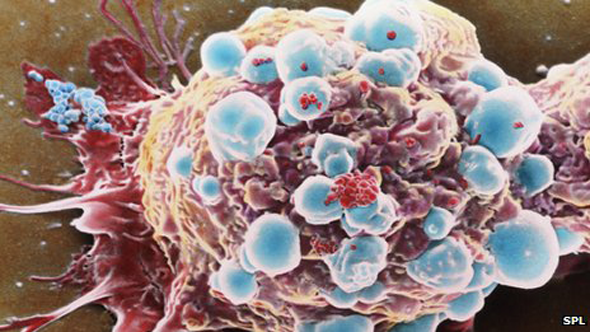 "About 90% of cancer deaths are related to metastases," said lead researcher Prof Michael King. The team at Cornell devised a new way of tackling the problem. They attached a cancer-killing protein called Trail, which has already been used in cancer trials, and other sticky proteins to tiny spheres or nanoparticles. When these sticky spheres were injected into the blood, they latched on to white blood cells. Tests showed that in the rough and tumble of the bloodstream, the white blood cells would bump into any tumour cells which had broken off the main tumour and were trying to spread. The report in Proceedings of the National Academy of Sciences showed the resulting contact with the Trail protein then triggered the death of the tumour cells. Prof King told the BBC: "The data shows a dramatic effect: it's not a slight change in the number of cancer cells. "The results are quite remarkable actually, in human blood and in mice. After two hours of blood flow, they [the tumour cells] have literally disintegrated." He believes the nanoparticles could be used used before surgery or radiotherapy, which can result in tumour cells being shed from the main tumour. It could also be used in patients with very aggressive tumours to prevent them spreading. However, much more safety testing in mice and larger animals will be needed before any attempt at a human trial is made. So far the evidence suggests the system has no knock-on effect for the immune system and does not damage other blood cells or the lining of blood vessels. But Prof King cautioned: "There's a lot of work to be done. Various breakthroughs are needed before this could be a benefit to patients."